Back garden ceremony. September 2018. Assembly House, Norwich. December 2018. ‘What an absolute dream Katie was. From the moment I met Katie I knew we had made the perfect choice. We sat together in a cosy pub and laughed and chatted for hours about our lives, and she made us feel totally at ease. When we finally got the ceremony draft through, we couldn't believe she had made such a stunning service that was so personal to us, so fun, so heartwarming, so full of love, without any of the cringe-factor or traditional elements I was hoping to avoid - although I'm sure she would do exactly that if that's what you were after, as Katie seems so intent to get the feel right for each couple. 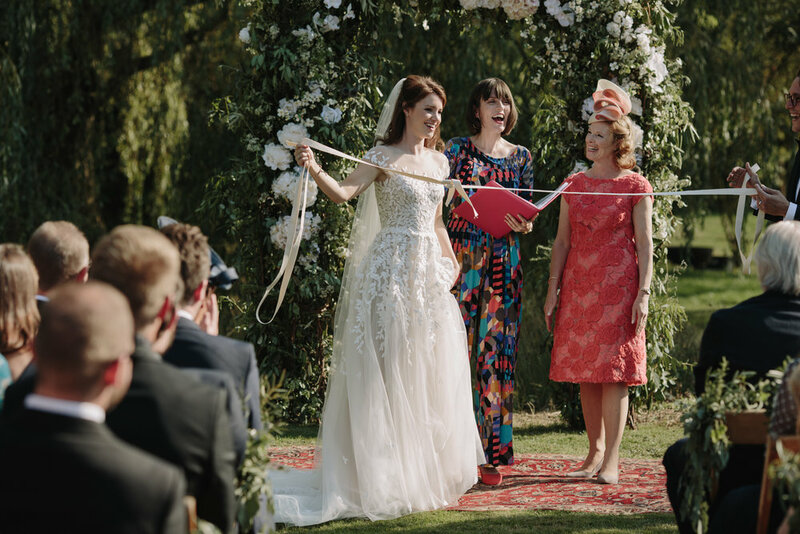 The idea of having a humanist wedding for us, was that, as well as being atheists, we wanted a wedding that reflected our personalities, and was a fun and joyous occasion. Katie certainly brought the fun and encouraged us to make our own rules, which turned into a unique and wonderful ceremony of friends singing, pug dogs bringing the rings down the aisle and little cousins reading their own poetry about love! The guests were in hysterics at points by Katie's warm and funny words and in tears at other times. Man she's good! 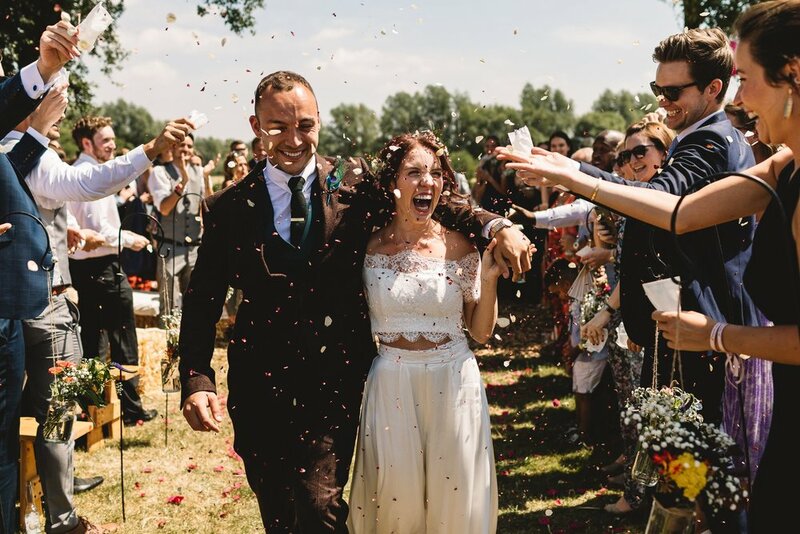 I had my huge weekend festival wedding of my dreams, with camping, brass bands, circus acts and glitter artists... but in all honesty the highlight of the entire weekend was that beautiful ceremony that Katie delivered. 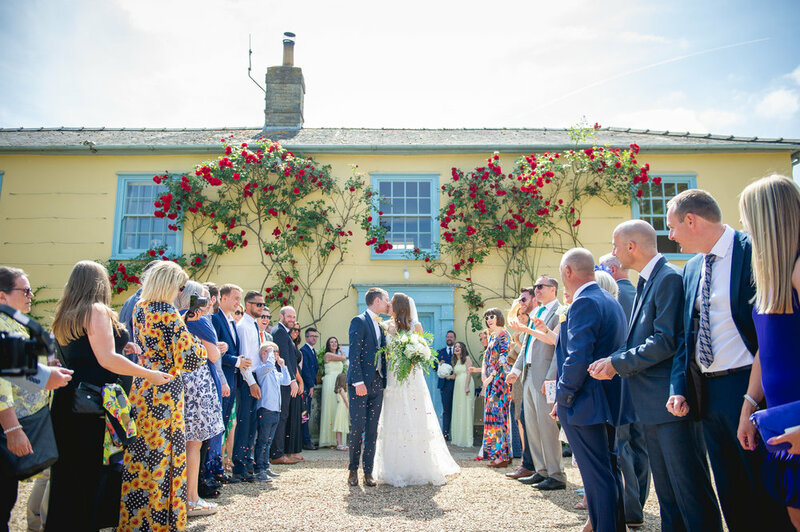 It set the tone of the wedding as being relaxed and fun and full of love, and is a something that has been echo'd with all our friends and family. Katie has an incredible talent in capturing your life so beautifully, and she's the coolest woman ever too! 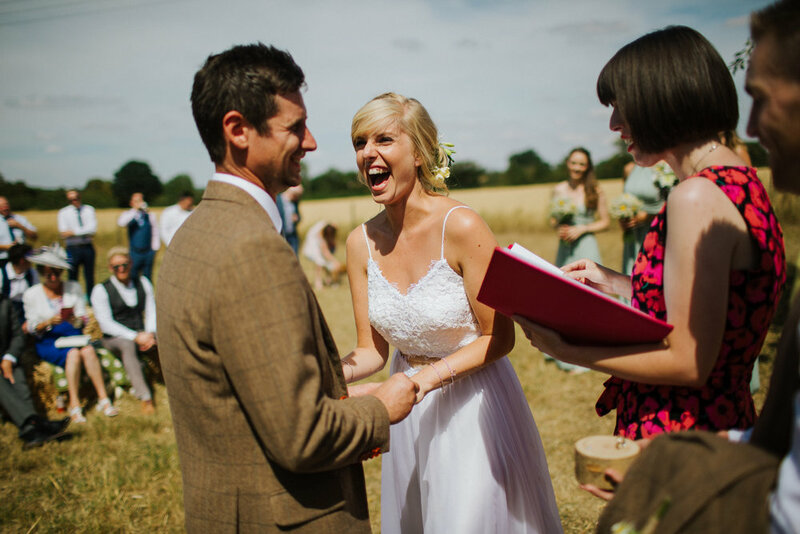 Candice and Lee’s incredible wedding festival weekend at Berryfields, Yarwell. Image by Kate Jackson Photography. One Friendly Place. October 2018. Liane and Michael’s ‘Jewmanist’ ceremony at One Friendly Place, in Deptford. Image by Lex Fleming. 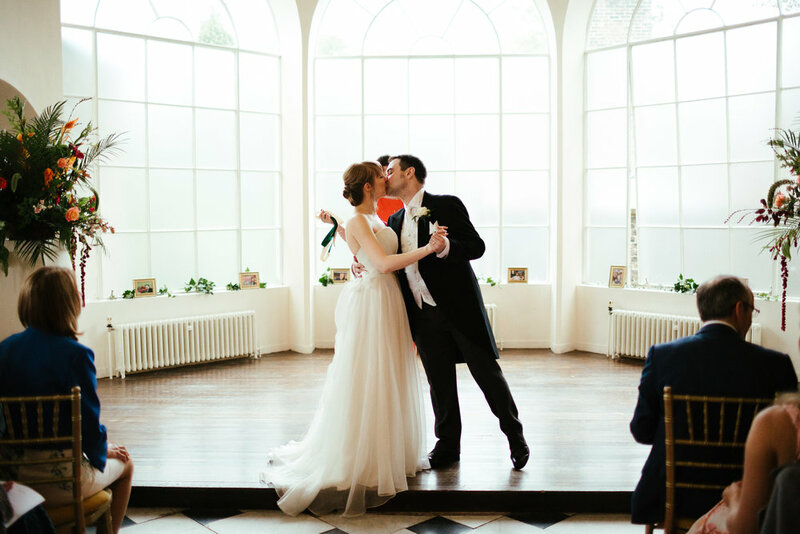 Amanda and Matt’s outdoor humanist wedding ceremony at Lanwades Hall, Newmarket. Image by Him and Her Photography. 'Where do I start?! From the moment I met Katie I knew I wanted her to be our celebrant. She’s fun, bubbly, friendly and made me feel so relaxed. Katie wrote the most amazing script for our ceremony that was so personal and completely perfect. New Barn Farm, Carlton. August 2018. 'Katie, you absolute 10/10 legend! THE JOCKEY ROOMS. june 2018. 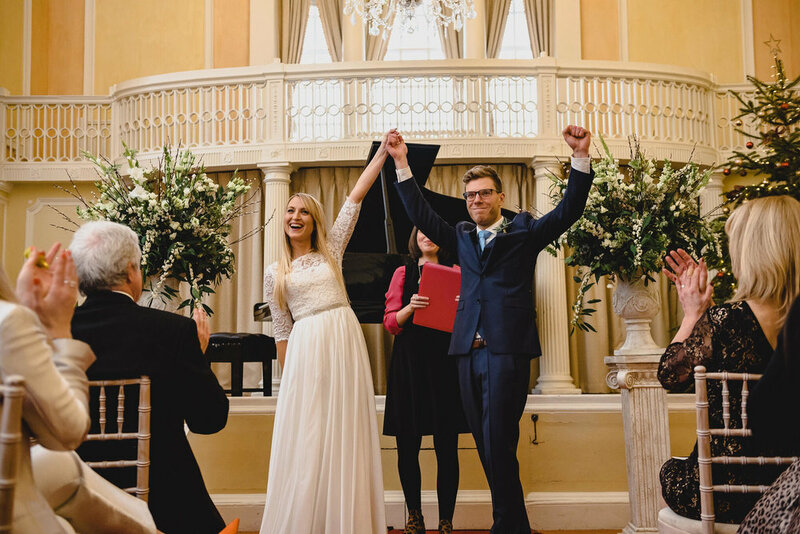 'Katie was an absolute dream and we couldn't have picked anyone better to conduct our ceremony. From the outset, her smile, bubbly personality and warm nature put us at ease and we had no worries that she would make the ceremony on our special day one to remember. We were not disappointed! Despite suffering from sinusitis (which Katie kept under wraps until after the wedding) Katie did a sterling job and had everyone laughing and crying - at all the right places! Thank you so much Katie we feel very lucky to have had you as a part of our wedding. You are the best celebrant out there and we could not have asked anything more from you. Katie literally saved my life. 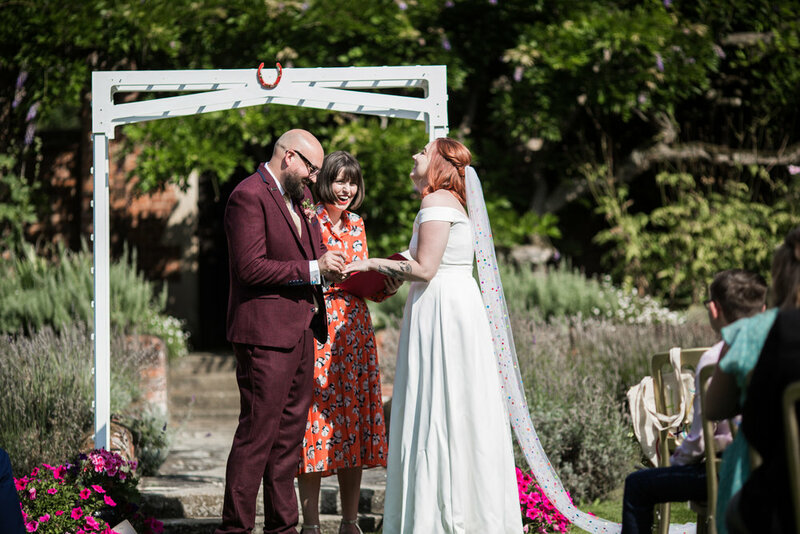 What turned from a panic request, primarily because of fussy traditional registrar practice, resulted in the most fantastic ceremony we had not even realised was possible. Katie and I shared a similar character from the start, from my initial phone call I could tell this complete stranger was going to understand my little excitable but positive attitude and understand how much this moment was going to mean but also how she would make everything work and everyone just smile - with my friends and family that is no easy feat! So personal - yes we could say the traditional vows of course, but we could also blend such a unique style to the ceremony that honestly made everyone go - that was so lovely and fun. I never once thought - is the bar open yet ? People genuinely laughed at the right times, smiled at the right times and perhaps the odd tear at the right time. Everyone always assumes that this just happens, but it doesn't you need a Katie to bring that together. Her pre-match team talks, venue visit with us, helping a panic bride piecing together her words beforehand. I know she even had a secret sign for the best man to start his ring walk....(this best man is not known for his timings!). 'Working with Katie was a joy from the first time we spoke. She got to know us and helped us to shape a beautiful ceremony that totally encapsulated who we are and what a marriage means to us. And she made it so much fun in the run up and on the day ! Kim and Ho’s bonkers outdoor humanist wedding (complete with Tequila shots, mid ceremony) at the fabulous Aynhoe Park. Image by Lina & Tom. 'Katie is very genuine and vibrant, both in how she expresses herself and in her sense of style too! Our guests were genuinely interested in what she had to say, and many people commented on her engaging and competent delivery on the day. Her communication was excellent as we were going back and forth with the script, and also from our Skype meeting to our in person meeting. She was really able to draw out from us what our relationship was about. She incorporated this so perfectly into our ceremony. Katie is a brilliant listener, and she expressed so carefully what she had observed during our meeting. Really impressive! Myatts Field Park. June 2018. Katie, Katie, Katie.... how do we put into words how we feel about the woman that narrated our crazy love story?! When Vanessa at R and F Weddings told us about you, we just knew we had to speak with you and boy, were we pleasantly surprised! From your bubbly bright smile and colourful shirts and earrings, you have been such an awesome person to work with. You just got what we were about and never tried to push a cookie cutter ceremony onto us. With all the secret surprises we were throwing at our guests, Hobo and I both said that we wished we hadn't read your draft because it made us laugh and we wanted your words to be a little surprise for us too! I can honestly say, without your words, guidance, humour and willingness to go with our flow, the ceremony wouldn't have been such an epic one! 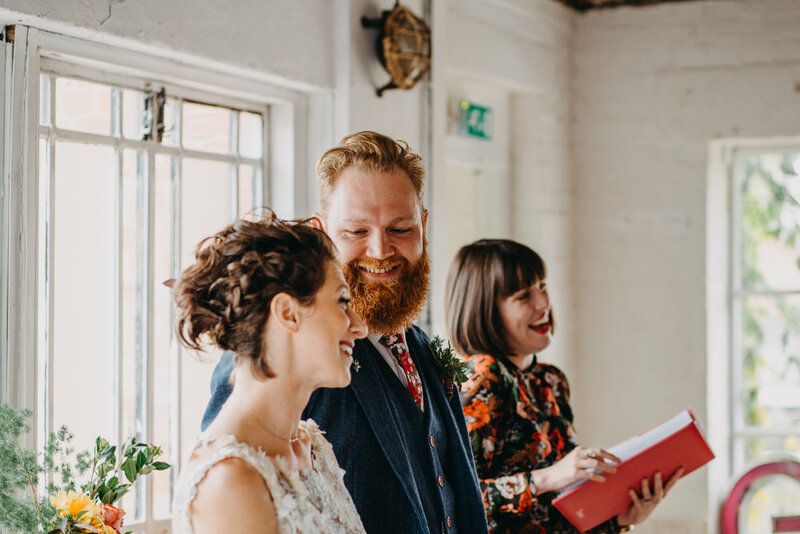 So many of our guests have all said they have never laughed nor cried as much during a ceremony and it was the best one they've been to - and it was all because of you Katie! You are a star and we couldn't be more thankful! Humanist Wedding Ceremony at The Jockey Rooms, Newmarket.